Ganesh Chaturthi is a festival held in honor of the elephant-headed god Ganesha. As the remover of obstacles, Ganesh is revered and much loved. He can be found in households, shops and even on the dashboard of your black and yellow cab. 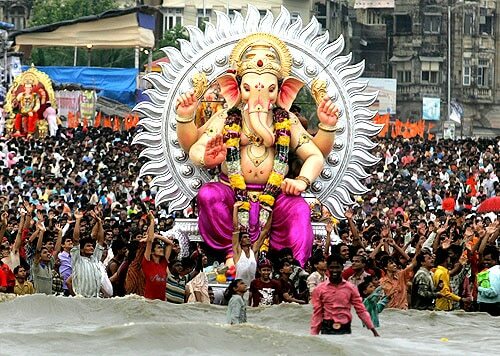 Over 10 days in August / September the festival of Ganesh Chaturthi takes over villages, towns and cities, but nowhere with quite as much fervor as in Mumbai and Maharashtra. If you happen to be in Maharashtra from the 5th to 15th of September, 2016 here’s some ways that you can experience this fantastic Indian festival. Crafting millions of Ganesh idols is a huge task that is actually completed all year round. One of the most accessible areas to see these magnificent creations being made is in the Mumbai area of Lalbaug. The area is also famous for being home to one of the largest Ganeshas, the Lalbaugcha Raja. Tucked amidst the many alleyways you’ll find artists making the final touches to their masterpieces. Many Ganesh idols are made in plaster of paris, which sadly is not very environmentally friendly, but there is a movement to also create more in clay. 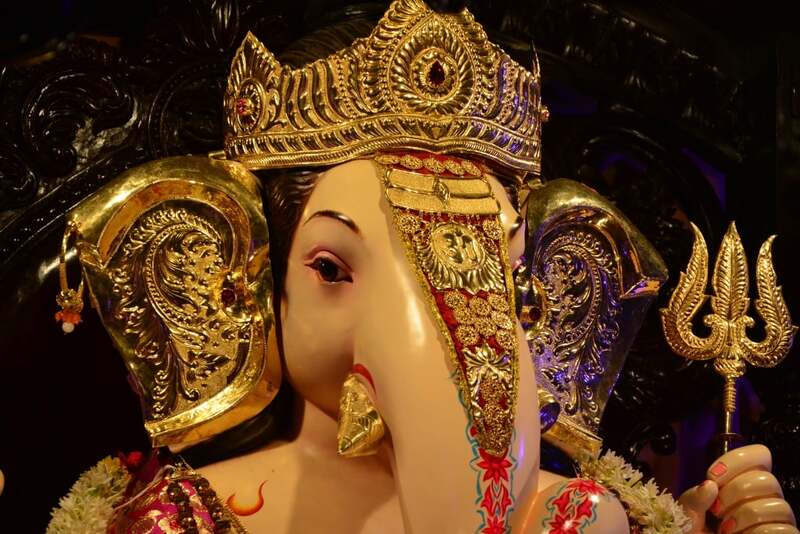 On most street corners you’ll be sure to find some glorious Ganesh statues being prepared for their big day, but there are a few that are famous for the size, grandeur and wealth. The Lalbaugcha Raja can be found in Lalbaug, and is one of the most revered. Be prepared to wait for hours to catch a glimpse of this huge idol alongside 1.5 million other people. Nearby is the Ganesh Galli Mumbaicha Raja which is one of the oldest in Mumbai. It has a different theme each year, often based upon another famous pilgrimage site in India. While the queues for the Mumbaicha Raja are long, they are well worth the effort. One of the most spectacular has to be the GSB Seva Ganesh Mandal located in the suburb of Matunga. It’s an environmentally friendly idol made of clay but its adorned with no less than 60 kilograms of pure gold. 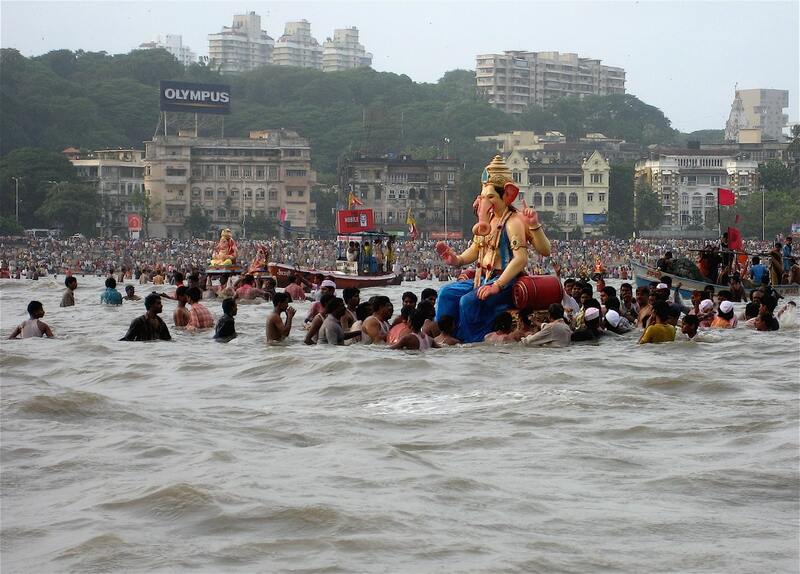 The climax of Ganesh Chaturthi is the visarjan or immersion. This is where families and communities sing and dance as they carry the statues they have lovingly kept in their homes to the water where they are fully immersed in the water. In Mumbai the coastline is the focal point for immersions, but in towns inland people flock to lakes and riverbeds. Some of the best places in Mumbai to witness a visarjan is at Juhu beach in the north and Girgaum Chowpatty beach in the south. Immersions are held on special days throughout the ten day festival, in particular at one and half days (6 September), three days (7 September), five days (9 September), seven days (11 September) and the biggest day of all Anant Chatudarshi (15 September). Be prepared for large crowds on these days. It’s recommended to visit as part of a larger group on foot, as traffic may come to a standstill.